La Banquise Poutine: As Good as It Gets in Montreal? Montreal Features Mountains of Poutine, But How Does La Banquise Stack Up? La Banquise Poutine: Montreal's Best? Touted by many as the best poutine in Montreal, whether you're new to poutine or just plain addicted, La Banquise is a 24/7 source and supply of over thirty variants of the classic Quebecois dish. But you have to be open to poutine. Real poutine. The kind where the cheese squeaks with every bite, the fries are pork larded to perfection and the sauce? Not too little and not too much, it's a salty brew with just the right hue of brown. Dense, heavy, oddly delicious with a trademark smoky aftertaste, La Banquise is always open for business outside of Christmas Day and while perhaps too casual for a first date, bring family or meet with friends after (or before) enjoying the Plateau's gorgeous Parc La Fontaine just across the street. It's also a perfect late-night destination after bar hopping in the neighborhood, or anywhere in Montreal. People are known to cab it there at 4 in the morning just for a bite. Explains the lineups. At last count, La Banquise sells 31 different kinds of poutines including a vegan version. Just five years ago, you were lucky to find any kind of vegetarian poutine in Montreal considering the sauce usually features meat broth, traditionally poultry-based. But in contemporary times, sauce bases include beef, veal, pork, foie gras and more often than ever, a strict vegetable base. Apart from its poutines served with guacamole and sour cream on top of an already heavy fries-cheese-gravy trifecta, some of La Banquise's crazier creations involve a mashup of four different meats. 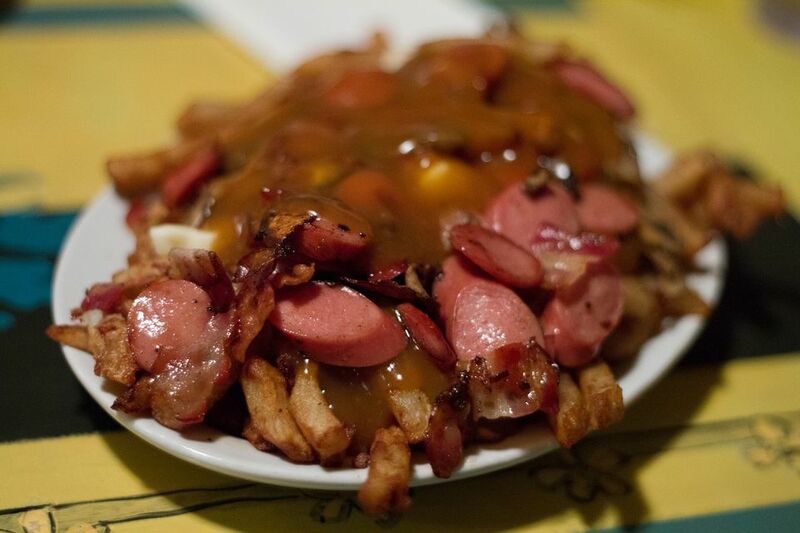 For example, La T-Rex is a poutine piled with ground beef, pepperoni, hot dog sausages, and bacon while La Fred Caillou (that's Fred Flinstone, by the way) features an inelegant but flavorsome mix of ground beef, smoked meat, spicy sausage, and merguez. Nutritionally speaking, just one of these meat-eater poutines easily exceeds most individuals' daily caloric needs. Non-poutine daily specials are offered and breakfast items are on the menu too but chances are you won't witness much bacon in here unless it's piled on top of a plate of fries with gravy. There's also a kids menu. Each dish, from breaded chicken to grilled cheese, is served with either steamed vegetables or fries and raw veggies. Milk, chocolate milk or juice are part of each trio. Then there's the ambiance. From the look-at-me exterior to the vividly colored walls, cactus and flower-themed table art inside, there's something creative, unique, and endearing about La Banquise's dining room, which may explain how it manages to stand out and attract lineups year in year out in the heart of what's probably the world's most competitive poutine scene. This La Banquise review is for information purposes only. Any opinions expressed in this profile are independent, i.e., free of public relations and promotional bias, and serve to direct readers as honestly and as helpfully as possible. About.com experts are subject to a strict ethics and full disclosure policy, a cornerstone of the network's credibility.